KNAC.COM - News - Do You Have An IRON MAIDEN Moment? Do You Have An IRON MAIDEN Moment? In celbration of 40 years of Nordoff Robbins, IRON MAIDEN, the 2015 O2 Silver Clef Award winners, want to see your "Maiden Moment". 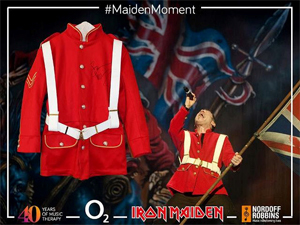 Until Wednesday, July 1, Nordoeff Robins want you to relive your favorite IRON MAIDEN memory to create a 90 second video of your #MaidenMoment. For every clip posted to their Facebook page, their panel of judges will select an entry each week to shortlist, choosing their winner on Friday, July 3. My Maiden Moment 1st Prize: The winner will receive a replica of the red “Trooper” jacket worn by MAIDEN vocalist Bruce Dickinson, signed by him and a Limited Edition vinyl picture discs of the first eight IRON MAIDEN albums packaged in gatefold sleeves and housed in a (Black) Collector’s Box. The runner up will receive a Limited Edition black vinyl discs of the first eight IRON MAIDEN albums. So if you're an IRON MAIDEN fan, they want to hear from you. Post your 90 second video directly onto the Nordoff Robbins Facebook page HERE, tagging them and IRON MAIDEN to be in with the chance of winning.